Comfort is an entire experience. It’s not just about taste, but texture, aroma and even the cooking experience can be comforting. That’s where roasting comes in! Roasting gets you so much flavor and complexity with embarrassingly little effort. The kitchen becomes all warm and toasty and rich aromas waft through the entire house. Of course the scent of roasting potatoes make you feel as snuggly as a kitten making muffins on a pillow, but the fennel adds an alluring licorice note in the air, making the experience just slightly more intriguing. It’s also got a great creamy texture, making this soup thick and velvetty. Because everything is roasted, there’s not much else you need to do to make it fabulous. No sauteeing, no spices; the oven gives you all the flavor you need. Once cooked, all you’ll need to do is puree. Lifechanging! Preheat oven to 425 F. Line 2 large rimmed baking sheet with parchment paper. Place sliced potatoes on one baking sheet. Drizzle with olive oil (1 tablespoon should do, but 2 tablespoons is ideal for browning.) Sprinkle with 1/2 teaspoon salt and add add several dashes fresh black pepper. Toss with your hands to coat completely. Roast potatoes for 15 minutes. In the meantime, prepare the fennel and onions. Slice the fennel bulbs from top to base, in 1/2 inch slices. Place on the other baking sheet with the sliced onions and toss with olive oil, 1/2 teaspoon salt and pepper to coat, just like you did with the potatoes. When the potatoes have roasted for 15 minutes, remove from the oven and use a spatula to flip them. Return to the oven on the upper rack, and place the fennel and onions on the middle rack. 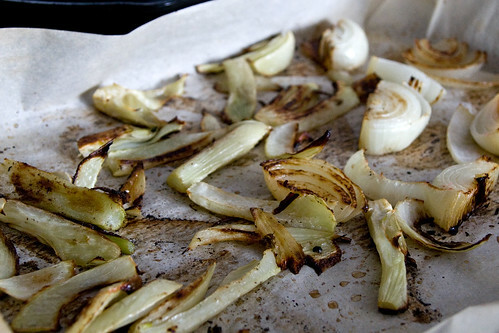 Roast for 10 minutes, then remove the fennel and onions, flip, and roast an additional 5 to 10 minutes. At this point, the potatoes should be tender and the fennel and onions should be caramelized. Reserve a few pieces of fennel for garnish. If using a food processor, place potatoes and fennel in the workbowl along with warmed milk and broth. Pulse a few times, so that it’s creamy but still chunky. Don’t over-puree or potatoes will turn gummy. Thin further with water, if needed. You can serve immediately, or transfer to a pot to warm a little more and let the flavors meld. You can also use a submersion blender by transferring all ingredients to a 4 quart pot and blending so that it’s creamy but still chunky, thinning with water as needed. Taste for salt and pepper, ladle into bowls, garnish with reserved roasted fennel slices and fennel fronds, and serve! I’ll use the yet empty comment section to tell how much you have helped me grow on my vegan path, Isa. I live in France and veganism is still quite small here, with very few people actually doing “cuisine”. I’ve forwarded your “culinary won’ts” post to so many people… I really hope you’ll be back in France one day to do another demonstration! Thank you SO MUCH for letting me know! I hope to be back in France someday, too. What an experience! Oh yes, yum yum. roasted veg is all I need…. Making this as we speak. It already smells delicious!! Aaaah, that looks so warm and comforting. Simplicity is beautiful. And roasting is just awesome. Hey Isa, I really appreciate the recipes you’ve been putting out, but i do have one caveat – I also have PCOS and have been trying to clear my skin by eating low GI and by reducing my processed food and sugar intake. A long-time vegan, it has been a little difficult choosing certain options over more comfort-food alternatives, but I feel like the last bunch of recipes that have been posted are not really the best at being low-fat or not so processed. I was just hoping you’d take note of this, because I do appreciate the recipes of late, but I’m hoping some lower fat/healthy recipes may take form in the future for those of us who may be trying to eat clean while not sacrificing taste. Sounds delicious! What is a submersion blender? @ Jane – she put out a whole cookbook of low-fat recipes, yo. i know, i have it. I was just hoping that some of the more recent dishes posted may have included some of those as well. That’s all. It seems a bit counter-intuitive to write the book and then have recipe after recipe of sugar-laden recipes appear on the personal blog. But i’ll leave you to it. Sorry. Hmm, this is confusing to me. What about this recipe is processed or sugar laden? Obviously the dessert recipes have sugar, but all of my recipes use from-scratch ingredients. You can always lower the fat content and I usually say so in the recipes. And many of the recent dishes are low in fat and would fit in perfectly in AFR (Curry Burgers, Alphabet Soup, Orzilla (reduce oil to 1 teaspoon), Hot Pot…and on and on. I even posted some low-fat desserts recently, as well as a wholesome caramel apple recipe sweetened with brown rice syrup. So I’m not sure what else you want from me! BLOOD??!? I don’t have any yukon gold, is russet an okay substitute?? This looks delicious! Yep, but peel them first. This recipe looks delicious and healthy to me! :] I look forward to making this sometime soon. I am loving all these comforting recipes. They are fitting in as “the perfect meal” on all these cold cold nights. Hey, thanks! I don’t know, people complain about everything. I do my best, and I thank you for the love. Truly. It definitely feels good to be appreciated. And as most readers know, if you request something nicely I usually come through! I just want to thank you for these phenomenal recipes(hasn’t been a single one that wasn’t a happy happy thing!). My husband and I have been vegan for just over 3 months, and we haven’t felt deprived one bit-thanks in large part to YOU! We are using one of your cookbooks or website almost daily.. Just made the Potato and Fennel soup-perfect for a cold night! You rock,Lady, and we appreciate you every day. Can anyone tell me what a submersion blender is? Just google “submersion blender” or “immersion blender.” It’s a handheld blender. Made it with russet potatoes, peeled as you suggested. It was sooooooooooooo hoooooo hoooooooo GOOD! If you listen closely you can hear my clapping all the way from Canada. just made this and had to stop myself from having a third bowl. so good! mine didn’t look exactly like yours – it was very chunky – i blended as long as i dared as i didn’t want it to get gummy but maybe it was just my food processor – but it was incredibly tasty! Made this soup for lunch on the weekend and I am now a total fennel convert. I haven’t liked it much before as it tasted a bit like a liquorice soaked celery, in my opinion. But roasting brings out such a lovely flavour. About to make another batch of this for the couple of days lunches! YUM! Making this now for Christmas Eve Eve. Making the veggie soup tomorrow for dinner. Also making your chocolate pumpkin bread and banana bread. My house smells so good right now. Merry Christmas all! Okay. So LOVE the idea of this soup, but do not have the required immersion/submersion blender!! Do you have tips for using Cuisinart? Or perhaps regular margarita-type blender? I had a friend who used her Cuisinart to make (a LOT of) roasted red pepper soups and, as you can imagine, it was a great big holy mess. Let me know what you think and, in the meantime — THANK YOU for helping me feed my Veg family with totally do-able and yummy recipes (Your no EB choc chip cookies are *amazing*!!!). I have almost all of your cookbooks and LOVE them! Instructions for a food processor is in the recipe, an immersion blender is not necessary! Just be careful not to overfill it and if it’s small, work in batches. It won’t take long at all. Isa, thanks for another wonderful soup recipe this winter! We made this tonight with a normal blender (gasp) and got it to work just fine – made it in batches and barely blended. It was DELICIOUS! We served it with your olive oil bread baked with rosemary. Mmm. Thanks again for wonderful, healthy, hearty recipes! Those roasted potatoes are marvelous! I’m going to roast them again just like that and serve it as a side dish for something… You are a gem! I want to thank you for all of your amazing recipes! I am fairly new to veganism and found your website while searching for recipes. I found myself consistently coming back here because everything turned out so good and I have not been disappointed. 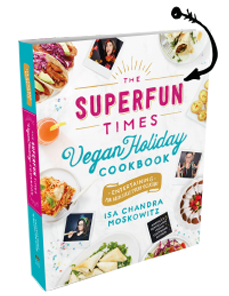 I even asked for Veganomicon for the holidays because I couldn’t get enough! Just made this soup tonight and it was so delicious and rich that you could not even tell its vegan! Thank you so much for providing us with these gems. You are very welcome, I’m happy that you’re enjoying everything! I just had a long conversation with my mama about ‘what to do with the kilo (seriously!) of leftover roast potatoes…’ Now we have decided that they will, by the powers of holiday magic and your website, become soup! I’m so stupidly glad that you’ve updated this over the holidays because I’m staying with my parents and all my/your cookbooks are in my apartment. Now to get a cooking. Just made a batch of this and have it simmering away on the stove right now. I promise, I’m not going to hoover the entire pot in one sitting. NOM NOM. I’m not a 100% committed vegan but am working up to being a 50% vegan. Your recipes make it possible. Lordy this is delicious! I added rosemary to the roasting vegetables and added roasted garlic into the mix. We added roasted garlic and rosemary too! We’ll let you know in oh about 30 minutes how it all went down. Our kitchen smells incredible right now!! OMGOSH this is a winner Isa! I blended it with my vitamix and it didn’t seem to go gluggy, phew. I wasn’t sure how it was going to taste as I have never cooked fennel before (but I love the essential oil and spice!). It was simply AMAZING. I made a double batch for 6 people and I thought there would be plenty of leftovers for lunch the next day AND THERE WASN’T A DROP LEFT! I couldn’t stop laughing as I looked around – my family literally were spatula-ing out the pot, licking the ladle and licking their bowls! They told me I should have made 3 lots (even though some of them had 4 bowls!!!!) I am making this again tonight by request. For this recipe, I also added garlic salt, two tablespoons of vegan margarine for a creamier taste, and way too much black pepper. I used 1/3 of a large onion since I’m only a moderate onion fan. Then I put everything (including the olive oil) into a slow cooker set to low for eight hours. I still have yet to master the art of slow cookers + vegan cuisine, so I was skeptical. Particularly since this was my first time cooking with fennel. I also thought, ‘Shouldn’t this soup have more herbs?’ But I let it alone. After letting the soup cool down for an hour or so, I processed it all in a food processor until just blended. It. Was. Heavenly. It even met with my picky husband’s approval. (Shh! Don’t tell him about the onions.) 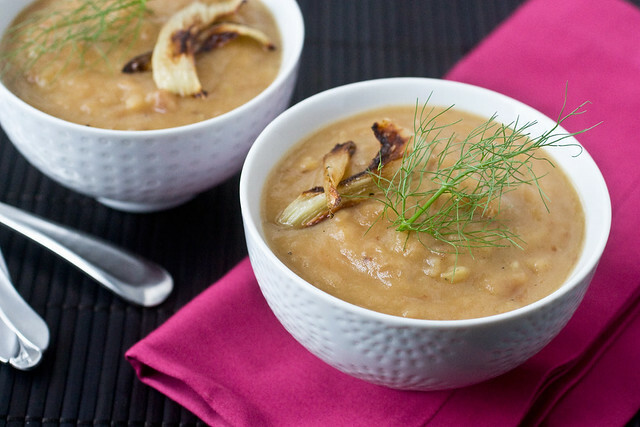 Thank you for posting a recipe that lends itself well to slow cooking; there is nothing like the aroma of potato-fennel soup in your house for eight hours on a dreary autumn day. Thanks too for making my first fennel experience a great one! here is a picture of the vegetables roasting! im so excited. Aw, the pic is private! Let me seeeeee. Happy Fennel Friday! We love this recipe and it is featured on our Vegan and Vegetarian Fennel Recipes this week! THANKS! I took some of this soup to my husband and a classmate of his while they studied for a test, then shared the rest with our other friend who is a surgery resident. One of the first things my husband said when he just walked in the door was, “that soup was amazing!” thanks for the recipe. I loved it too, and it is so simple. Going in the “favorites” section of my recipe app! Hey Isa I’m reading this totally rad recipe but my fennel has disappeared tonight! Any suggestions for replacements? Xo! Thanks for keeping me from boiling the snot out of my onions and potatoes. Great soup. Great flavor. Will make again! I made the soup tonight. Amazing. I’m literally licking off the soup bowl. Many thanks! This is just delightful. It tastes like a complex and delicious treat, but takes almost no effort (hello Vitamix). And my toddler is in love with it, so double bonus points! Thanks for posting this recipe Isa! I just got potatoes and and fennel from the co-op so I was excited to find this recipe. BTW, I have nearly all your cookbooks and just ordered the newest one. I am one year a vegan and could not have done it without you and your culinary brilliance so thank you very much! I recently tried fennel and loved it. I was excited to try it again and this recipe sounded easy and delicious. What a perfect supper recipe; hearty and delicious. Will definitely make this again! Thanks for sharing it. I’ve never had fennel because I’m not a licorice fan (neither is my husband), but we have a bulb from our CSA delivery and I’m thinking that this would be a great recipe to try. I don’t have yukon golds, though, I have white sweet potatoes. Do you think that the sweetness of the white fellas would accentuate the licorice-ness? Also, what else can you do with the fronds? Me again-I just threw caution to the wind and used my white sweet potatoes instead of yukons. As someone whose tastes have become extremely well-rounded but cannot, will not get down with licorice, this soup was outstanding. There was a super mild licorice scent while prepping the bulb and kinda sorta while roasting, but the oven truly transforms the fennelly flavor from licorice into something complex and wonderful. Great recipe, Isa! Oh-I only slightly modified by cutting the recipe in half (only had one fennel bulb), however I still used a whole sweet onion. I also blended this a bit in my food processor before serving, and I thinned it a teeny bit with water. This still turned out to be thick and fennelly/fall-tastic with roasted brussels sprouts and garlic-infused bread. This meal rocked my socks. minor treatment packages, as well as individual protective equipment.